Car, train and aircraft makers are investigating whether they have used any sub-standard materials made by Kobe Steel. The checks come after Japan's third largest steelmaker admitted falsifying quality data, possibly for as long as a decade. General Motors, Boeing and Toyota are among the firms checking their models. 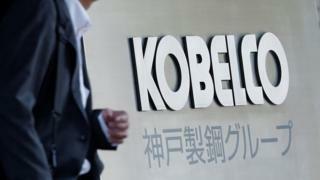 An internal investigation at Kobe Steel found 70 cases of data tampering at its Kobelco Research unit. Shares in Kobe Steel fell by nearly 40% in two days, wiping more than $1.5bn (£1.1bn) off its market value after the firm admitted fabricating data about the strength and durability of products it delivered to more than 200 companies. Kobe Steel spokesman Gary Tsuchida told the BBC the firm regrets the falsification of data. "There were tens of employees involved. It seems in some cases quality control was undertaken by veteran employees who had lots of experience, highly trusted within the organisation, and somehow these discrepancies slipped by them." Mr Tsuchida insisted that Kobe Steel was taking all necessary steps to investigate how this happened. Kobe Steel's President Hiroya Kawasaki will meet a senior official at Japan's industry ministry on Thursday, reports say. In Japan and abroad, manufacturers that have used Kobe Steel materials have been racing to check that the safety of their own products has not been compromised. Central Japan Railway said some Kobe Steel parts for its bullet trains did not meet Japanese industrial standards, but there were no safety issues. Hitachi said its new trains in Britain used Kobe Steel but had all passed rigorous tests. US plane manufacturer Boeing also said it had not found any safety issues. But Mazda said it was still investigating after it used Kobe aluminium in some car bonnets. "We won't know if we need to take any action until those investigations are complete," a spokesperson said. And Honda said that aluminium produced by Kobe Steel had been used in doors and bonnets of some of its cars. The crisis at Kobe Steel is the latest in a string of recent scandals at major Japanese companies. They include cases of falsified data at Nissan Motor and Mitsubishi Motors, while air bag maker Takata filed for bankruptcy in June over faulty airbags which were blamed for several deaths and many injuries. Toshiba is still working to recover from an accounting scandal that began in 2015. Martin Schulz from Fujitsu Research Institute said a focus on cost cutting has been one contributing factor to the corporate failures. He said an extreme focus on reducing costs over the past two decades has seen "management in many subsidiaries bettering their results beyond their means, while an increasing focus on profitability is stretching the limits of quality control".